The founding partner at Diller Scofidio + Renfro discusses her current projects. 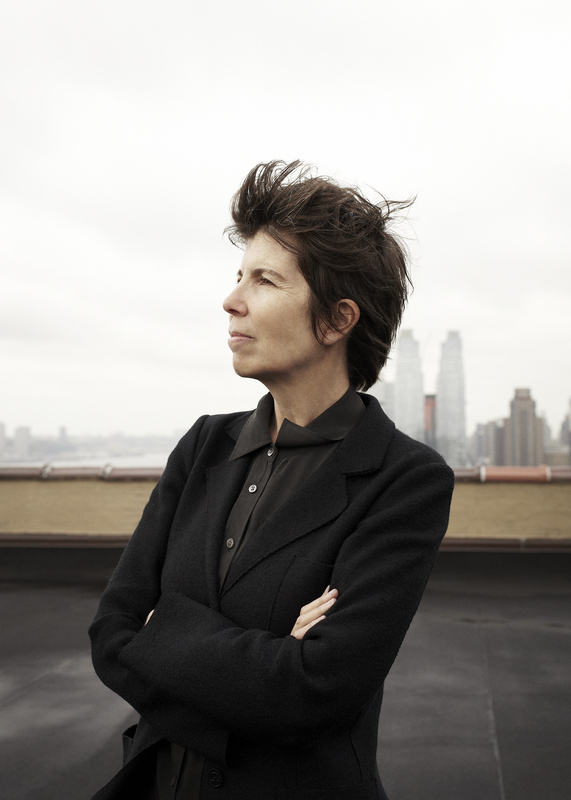 The 35-year career of Elizabeth Diller, a founding partner of the New York–based architecture studio Diller Scofidio + Renfro, is a study of contrasts: conceptual and pragmatic, temporary and permanent, iconoclastic and institutional. After graduating from Cooper Union in 1979, Diller started her practice mounting temporary installations with her partner and future husband, Ricardo Scofidio, their interests leaning closer to art and theory than conventional buildings and construction. Today the duo—along with Charles Renfro, who became a partner in 2004—is responsible for some of the most important architectural projects in the country. DS+R counts Boston’s Institute of Contemporary Art (completed in 2006) and a makeover of New York’s Lincoln Center (finalized in 2012) among its highest-profile works. Especially influential, at least among architects and academics, has been the firm’s unbuilt Slow House (1991), a proposal for a residence on Long Island, New York, renowned for its examination of how we see in a media-saturated world. One notices sharp contrasts not just in the firm’s work history but in its public reception as well. Widely lauded for repurposing a dilapidated elevated railway into New York City’s beloved High Line park (the third phase opened in September), DS+R received heavy criticism this year for its involvement in a major expansion proposal for the Museum of Modern Art. The museum’s plans included the demolition of its little-guy neighbor, the American Folk Art Museum; despite efforts to work the idiosyncratic building into the design scheme, Diller’s studio, hired to lead the expansion, ultimately acknowledged that the structure couldn’t be saved. Surface recently met with Diller at her office in Manhattan to speak about the ensuing controversy, as well as early career experiences that have influenced her firm’s recent commissions for cultural institutions, including the current exhibition “Musings on a Glass Box” at the Cartier Foundation in Paris (through Feb. 25, 2015), a collaboration with composer David Lang and sound designer Jody Elff. Diller, 60, is pensive and surprisingly relaxed for someone whose aides are constantly interrupting her to remind her of meetings she has to attend. She speaks with an erudite inflection befitting her academic credentials and professional accolades (she is, after all, a professor at Princeton and a MacArthur “genius grant” recipient), though she smiles with the ease of an affable neighbor. Your career began with projects that fell somewhere between art and architecture. Is this interdisciplinary approach still a key part of your practice? There’s really very little that’s not interdisciplinary. Architecture in and of itself is the intersection of technical and creative disciplines. We really don’t make a distinction between architecture and our work on independent self-generated projects, research, performance work, installations, curatorial projects, and things like that. They’re all running parallel. Maybe we make a slight distinction between income-generating and income-losing. That’s a nice way to split up an office: the money-making and money-losing divisions. [Laughs] There’s a lot of money-losing, and there’s actually someone in charge of that, with that on their calling card: “The Head of Money-Losing Projects.” We’re constantly working on multiple agendas, and there are a lot of things that interest us. Architecture is not the only way to express it. What’s an example of a money-losing project that helped inform a money-making one? Are these intersections between different typologies and disciplines relatively new interests for architects? We often witness what are supposedly radical collaborations between architects and performance artists, musicians, and other creative professionals today. Was this boundary-blurring always present in the practice of architecture or has it really taken off in recent years? How much of this were you seeing in your early career? In the early 20th century, there were interesting examples of architects who were also painters, who were also involved in performance. But I was in school in the ’70s, and at that point it wasn’t obvious that there were great models [for cross-disciplinary work] out there. The models were artists who were working in installation formats with various media and working across disciplines in art. Architecture was a little harder to find. But my interest was always in art; architecture was really a sideline. Only after I got my architecture education, after I graduated with a professional degree, did it really occur to me that, hey, I could also do architecture. I never had the intention of actually doing architecture when I was in architecture school; it was only a discipline I was interested in finding out more about. Wait a second. You were planning to be an artist even though you were training to be an architect? My parents had always tried to push me into architecture because it was a way I could actually earn an income while I was doing what I really loved to do. It was a practical way of being creative. For me, it was a total turn-off that my parents were pushing me into it, so I actually distanced myself from it. But you liked it enough to study it and stay with it. One course I took at Cooper Union I enrolled in simply because I wanted to know what “architectonics” meant. I actually never really found out. [Laughs] But architecture school was really compelling to me because there were a lot of interesting thinkers there, and there was debate. Students were not totally independent. In the art school, it was very unstructured. I was attracted to a more structured and more dynamic context in which there was a lot of discussion. You had to contextualize your ideas, and you had to defend them. So I started to go from 2-D to 3-D. I was really interested in photography and film, and by the time I graduated, I had started to think about things spatially. I wanted to do installations. In any case, I graduated with a degree in architecture. I didn’t want to give my parents the satisfaction of knowing this, so they didn’t find out until graduation day that I had an architecture degree. A couple of years later, I started to teach and do some independent projects and research, and one thing led to another. I strongly felt that it didn’t really matter what you called the medium of space, whether there was a client behind it or it was independently generated, paid for by credit card or grant, whatever—it didn’t really matter. As long as it was public. That mattered a lot. I was very interested in how we receive culture spatially: how rules of space were governed, what the inheritances were, and what demanded rethinking. There were issues of privacy and publicness, issues of property and interface. It mattered to me that I would play in real space with real human interaction. It didn’t matter whether it was large or small or how it was funded, or whether it was temporary or permanent. None of that mattered. What mattered were the experiments and the actualness of them—not just theorizing them, but playing them out. A lot of the early work was, in fact, temporary and on a credit card, and it was thrown in a New Jersey dumpster afterward. It had this very short-term effect. But it led to more projects, and it was a form of research. This is when Ric [Scofidio] and I started to work together. I felt it was just much more fun to make things and really engage the public. What were some “aha” moments or projects that you feel were critical in shaping your career? There were many projects that had seminal value. After we did independent, guerilla-type work, we were asked by galleries and museums to do installations. We had a commission at MoMA [“Para-Site,” in 1989] to do one of the museum’s Projects series installations. It occurred to us at the time that even though we were working in multiple media, not necessarily bricks and mortar, we would have to think through the lens of an architect in the museum, because we were in a Durrell Stone, Philip Johnson, and César Pelli space. So how does an architect make a mark here that’s different from what an artist would do? We wouldn’t want to bring in models and drawings and put them on the wall. We had to be really critical and think about the thresholds, the moment of institutional definition between the municipal street and the private institution, and then between the public space and the gallery space. This was in the middle of a lot of discussion about rethinking the museum—it was a kind of institutional critique. Another really important project was the Blur Building [a Swiss National Expo platform built atop Lake Neuchâtel, Switzerland, in 2002, and intentionally shrouded in artificial fog]. It was the first project in which we started to think hard about audience, something that really never occurred to us before. Most of our following were academics and people interested in art and architecture; we had never really done anything for a broad-based general public. So we began to think about how to do work that could be read on many levels at the same time. We got very involved in this environmental-scale project. It was a turning point for us because it was a really large-scale experiment with technology that challenged the notion of materiality, of inside/outside, of scale. Yet it was essentially a display of fog, of nothingness. There was no there there. Typically in exposition pavilions, you want to represent nationalism or perhaps technologies, something about the culture. We were really delighted by the idea of making an exposition pavilion where there was nothing to see and nothing to do. It was truly about nothing. That’s one of the themes that actually runs through a lot of our work, this question of what happens when you remove more and more. You’re making something, but what you’re doing is perhaps taking away the conventions of value. So what you have is something that doesn’t seem like it’s full of value but perhaps is. Maybe it’s like you’re framing nothing so that people will notice it and realize that it’s really something. That’s our position on the High Line. One of the things that I believe makes it successful—and it’s something we never truly anticipated—is that you can’t ride a bike there, you can’t throw balls there, you can’t play Frisbee there, you basically can’t do anything there. You can walk or sit. And yes, you can eat. But it’s giving New Yorkers an opportunity to do something they’re so unfamiliar with. We’re always doing something. If we’re not working, we’re looking at our devices or burning calories or trying to be productive in some way. And the notion of having a place that’s devoted to nothing is special. I think people see it as exotic almost. And then, to make it even more emphatic, we have this grandstand that pops down and looks at the taillights of cars going up Tenth Avenue. So while you’re doing nothing, this is like more nothing than nothing. But it’s a hypnotic nothing. It’s hard to stop looking out that grandstand window when you’re there. It’s like a contemporary lava lamp. It’s a new form of Zen or something. It’s constantly agitated and dynamic; it really pulls you in. You’re not at ground level, so you don’t have to move out of the way for anyone. You’re just kind of at your own pace and speed. The third phase of the park just opened, 15 years after the start of the project. How do you feel about the evolution of the High Line from a wild experiment in urban planning to a top-billed tourist attraction? I feel good, and I also feel ambivalent. On the one hand, it’s great that we transformed this from something that was about to be torn down into something that has been appreciated by so many people, and even the most critical of folks still appreciate what’s there. There are many critics now who say it’s too popular. It’s not only its popularity and the catalytic effect it has had on real estate and the development of the West Side, which has grown faster than anybody could’ve predicted. It has also mobilized other governments in different parts of the world to do the same. This notion of reinventing infrastructure, rethinking what we already have, has caught the public imagination. When we talk about the speed of change and whether we really love being there on a weekend, with the amount of people that are there: I think this is a phenomenon that’s not just about us making a successful project. It’s also global tourism; you go off to different parts of the world and you see that New York is an attractor. So the High Line is an attractor inside of an attractor. I’m not xenophobic. There are people who are disparaging toward tourists; I don’t really feel that way. When I hear a lot of languages on the High Line, that’s really interesting to me. I love that New Yorkers can spend time there, and I love that it’s a draw for international tourism. With all of the new developments, do you ever get nostalgic about the New York you knew back in the ’70s and ’80s? I have an ambivalence about the kind of future that might be more homogenous, and I have a nostalgia for a kind of irretrievable past. I think most of these are fears, or pathologies. I agree that New York sometimes feels too crowded or too big. But the fact that that’s part of an ecology that’s triggered by some kind of catalyst is just a very interesting phenomenon. I like to immerse myself in it and not make a value judgment like, “Oh, it’s really too bad we lost this.” I do feel nostalgia, and yet we can’t just look backward. The past is irretrievable; there are buildings that are remnants of it and they’re beautiful. Part of their beauty is their abjectness, and we’d like to keep that in a balance with new construction, this sense that New York can be in a state of limbo between past and future. For the critics of the High Line becoming too populated: What’s the answer? Do you make things that are not good and won’t attract? We have to design forward, and we have to make the best things that we could possibly imagine making. And if they’re popular, so be it. They change, they transform over time, and there are new things. Let’s return to your experience with MoMA. You mentioned that your first installation there was a way for Ricardo and you to be critical and question the museum’s identity and its parameters. How has this influenced your current role not as museum challengers but as museum architects? We started off on one side of the institutional critique and we could never imagine ourselves actually being in a museum, let alone speaking the voice of a museum or making the walls themselves. We were on one side of the wall or the other, as artists inside and critics outside. But making the walls was something that we had never anticipated, and it wasn’t until we did the Boston ICA [in 2006] that there was this big understanding, this change of heart, when we realized that the institution we were critiquing was inviting us in to speak on its behalf. And the person who was running that institution was very accomplished and also independent and freethinking and critical. We realized that maybe things were changing, that one can’t just take a critical position. We were able to invest a lot of energy into that first museum and think about the ways architecture is a partner of art. Each time we’re stepping into that role, we’re thinking about that particular institution, what opportunities it has, what limitations, what inheritance. We never think of ourselves as shooting down some star or landing on a tabula rasa. We have to acknowledge that the world was there before we got here. We want to comment on it, spin it, and engage it.